It’s 4:30, so I call up the on-site contact for Quinn, Ryan. He tells us to wait outside, and that he’s going out to bring us into the venue. My friends and I look at each other with excitement. He then brings us to the back of the venue, up a flight of stairs, and into a room, and we sit down on the black leather couch and wait as Quinn finishes his soundcheck. After some time passes, Quinn comes into the room, radiant and smiling. We stand up and greet each other, and it’s already clear that he is a down to earth person. We all sit down around a coffee table, and we get straight to the interview. “I didn’t grow up wanting to do music full time,” he says as he finds a comfortable spot on the couch. “I always grew up liking music a lot and liking writing. You know, when you grow up you wanna be a baseball player, a firefighter, stuff like that. That was never my dream job. Truthfully, I didn’t know what I wanted to do until I kind of started doing music. But I always knew that I loved, loved music and I loved writing, and then one day in high school I kind of fused those two passions together. At this point, he’s found a comfortable spot on the couch, and we’re looking at our papers, trying to search for a good question to ask. We then point out how he’s been getting some looks in the industry lately, and attention in general. “The shows have definitely gotten bigger, I think more people are coming to see me perform, and more people know the words to songs which is amazing. It’s not like I’m getting stopped on the street every day. It does happen, but it’s not an issue where I need bodyguards on me. I’m still very much the same person that I was a year ago in that sense. But as far as the music goes, streamings are getting higher and I just think that my catalog is growing stronger in terms of people getting attached to it and listening to it. Slowly the interview is becoming less of an interview and more like an actual conversation; words are flowing, and we’re looking at our papers less. I’m wondering why I was so anxious about the interview in the first place, and we continue to conversate. His debut album, The Story of Us, reached #6 on the iTunes Pop Chart. It’s a conceptual kind of album, describing a different kind of relationship on each track. To stay on the same topic of pursuing dreams, we ask Quinn if he has any projects in the making, and his eyes light up. We look at him, and it’s as if he can anticipate the question we’re going to ask; he answers it before we say anything. “I wish I could say who, I can’t spoil it now, so I’m gonna keep that on the DL, but yeah. I’m working on as much as possible right now. I’m also trying to balance being on the road and doing shows and stuff, which is always kind of a tricky situation, but I’m learning as I’m getting more into this, how to balance that. I’m going to try new things with the new album, too. I think my voice is something unique enough to the point that my voice still sounds like a Quinn song – at least, I like to think that. “I think it gives me the ability to try new things because, at the end of the day with my vocals on the record, it’ll somehow turn out like something that’s from me. What I mean by that is it won’t sound random in a way. I want to experiment with new stuff on this next project. Ever since Quinn XCII collaborated with producer and childhood friend ayokay on the notable track, ‘Kings of Summer,’ he has reached the mainstream with high school and college students. With melodious and laid-back songs like ‘Straightjacket’ (which has over 33 million streams on Spotify and was dubbed as Soundcloud’s Song of the Month,) it’s no surprise that he has caught the eyes of many. We then ask him what and who inspires him to pursue music. “I would say definitely ayokay, who’s my friend, producer. He executive produced everything up until my debut album, The ‘Story of Us’. My EPs, ‘Change of Scenery’ and ‘Bloom’, he produced. That kind of got my name out there in the music community and industry. |He was responsible for all the beats behind that, so I’d definitely have the credit him at #1, because he’s always been my corner for my sound and like, having faith in me. He’s always motivated me to try new things and stuff, so yeah. We’re always working together. I would say also my family and fiance and just close people in my life that don’t even associate with the music industry. ||They’re just supporting me. Without them, I could definitely see myself, at times, getting down. I got down on myself way too much early on, naturally, just with doubts and such. It is hard to make a name for yourself, especially in music, so trying to find ways to stand out and stuff, I always struggled at first. Attention from his singles has aided him in selling out the majority of concerts in his recent string of shows across the United States, The Story of Us Part II Tour. “I think touring builds your confidence, like when talking to fans, and recording and doing interviews like this. You just kind of gain a better sense of who you are as an artist and person when on tour. I think it builds your character more. Now this being my second headlining tour, it really helps with stage presence, for example. It really helps with how you project yourself towards your audience because they’re all strangers at the end of the day. You want to make sure that they’re comfortable with you on stage and make it seem like it’s almost your house and you’re inviting them into it. “You want to make sure that they feel like they’re at home and they’re relaxed and uncomfortable, because if they see that you’re uncomfortable then they’re going to feel the same as well. “It’s like when you see somebody doing a speech in class and they’re clearly nervous, and you’re at your desk thinking ‘now I’m nervous!’ It’s the same thing with music, so you definitely want to be comfortable and conscious of shows, for sure. I’ve been the opener for two tours, and it was great; a really cool learning experience. It really helped me with becoming a headliner. It’s totally different, though. It makes you feel as if you’re not the center of attention, which is good in a way because it humbles yourself a bit and makes you appreciate getting to this point more. “Like, I toured with Louis the Child as the opener. We were in this little van, and we got the worst seats on the bus, and I was in the very back in the corner using my backpack as a pillow. It was terrible. I don’t think you can appreciate now sleeping on a bus where it’s comfortable until you do stuff like that. Anything in life, really; until you suffer a bit and work hard, it makes it so much sweeter when you get to the point of where your goals are being accomplished. Our time is almost up, and my friends and I are wishing that we can stay and talk to Quinn longer, but we’re aware that he’s on a schedule. His show starts in a couple hours, so we decided to ask about how he feels when he gets on stage. We point out that that’s the exact same comparison we made when describing the feeling we had before the interview, and he laughs. It’s nearly 6 now, and we have to say goodbye to Quinn so that he can prepare for a meet and greet with his supporters. We take a picture together, say goodbyes, and exit the door. As we walk down the flight of stairs and walk around back to the front of the venue, we laugh about how nervous we felt before the interview. 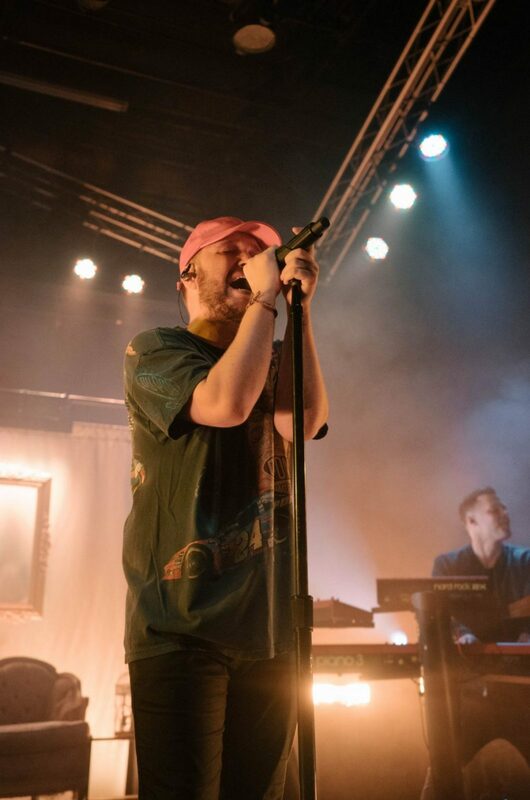 With a distinctive sound, genuine stage presence, and a down to earth personality, it is no surprise that Quinn XCII will be the “next big thing” when it comes to pop, soul, and electronic music. If I were you, I’d listen to him and buy tickets before all his shows sell out.